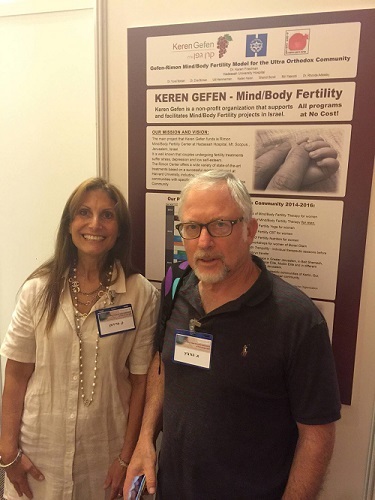 Dr Karen Friedman, a Hadassah Doctor who helps women with fertility issues, had a Poster Presentation at the Annual Ayala (Israel Fertility Association) Conference. Dr. Friedman, a psychologist, is both Director of the Keren Gefen-Mind/Body Fertility Organization and Director at the Hadassah Rimon Center at Hadassah Mount Scopus. Women undergoing fertility treatments often suffer from anxiety, depression, tension, low self-esteem and relationship difficulties. Research shows that stress due to these emotional states lower the fertility potential of women. Consequently, psychological support is an important factor in the treatment of women undergoing fertility treatment. The Keren Gefen-Mind/Body Fertility Organization offers this support for free at the Hadassah Rimon Center. In the photo above, Dr. Karen Friedman stands with Professor Aryeh Hurwitz, Head of the In Vitro Fertilization (IVF) Unit, Department of Obstetrics and Gynecology at Hadassah University Hospital Mt. Scopus, in front of the Poster explaining the work of the Keren Gefen-Mind/Body Fertility Organization.